Back in the late 1980’s, I saw an article in a magazine about ‘quilt-as-you-go’ blocks and quilts. I decided to try it utilizing my sewing machine and ‘Grandmother’s Fan’ pattern. I made several dozen blocks. I kept these blocks stashed away in my antique blanket chest along with other tokens and handiwork my family and I had assembled through the years. My friend Shelly would often visit and as we sat on the bed and talked, she looked through that chest. She seemed attracted to the fan blocks, laying them out and selecting her favorite blocks. Years later, I decided to assemble some of the blocks into a lap/sofa quilt for Shelly and husband Jerry for Christmas. I’m sorry I didn’t have time to do more hand quilting on it but she seems to like it. Like it?!?! I LOVE IT!!!! I still ‘pet’ on my favorite squares and enjoy remembering the times sitting and visting them long before I ever dreamed of receiving an assembled quilt! This quilt is my most treasured (and enjoyed) quilt…and now, it has become Jered’s favorite. When the boys spend the night at Nana’s house, Jered asks to have the ‘rainbow quilt’ to sleep with! 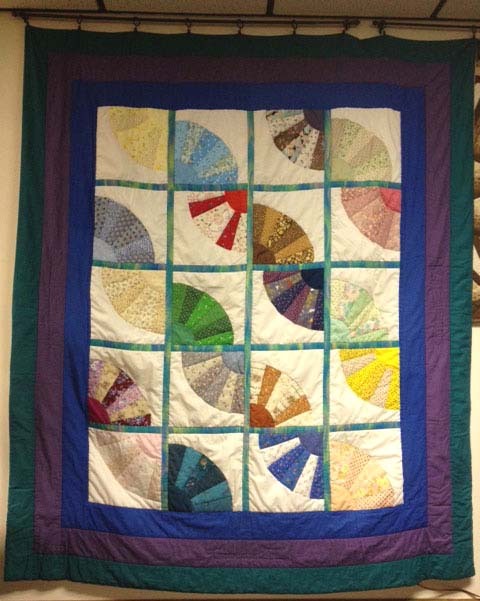 I was at a “Disaster Relief Auction” (fundraising event) recently and saw a quilt with this fan pattern….the blocks were laid out so they created big circles…..I prefer the way you laid the blocks out Much better!! Thank You, once again, for giving us this beautiful quilt!